Trader Joe’s Garlic & Herb Pizza Dough? After living in Colorado Springs for nearly four years, Trader Joe’s has finally graced our city. Why it took me nearly two months to finally shop there until this past weekend is truly puzzling. I bought my same favorites just as I had when I was living in California, but I happen to see their garlic & herb pizza dough. I’ve never bought ready made pizza dough, I usually make my own but thought I’d deviate from my usual Trader Joe’s list and give it a try. So after seven hours of Christmas shopping last night I realized that I hadn’t eaten lunch and I was really hungry by the time I got home. 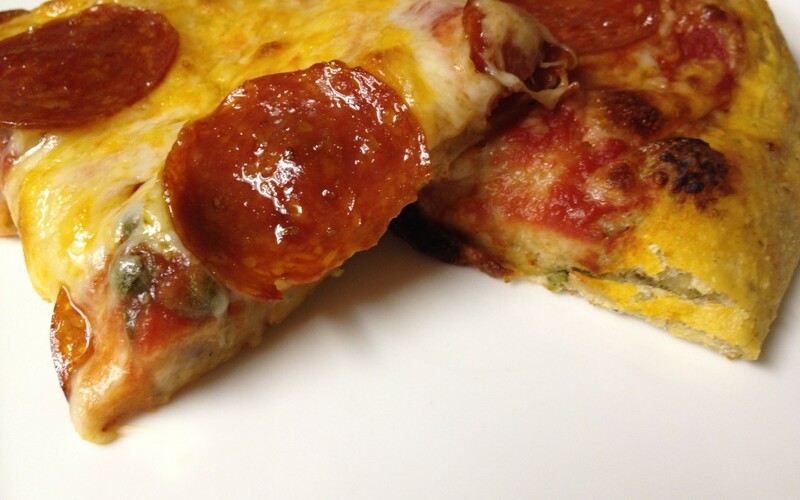 There wasn’t much in fridge, except for the Trader Joe’s pizza dough! . 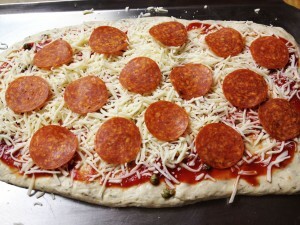 . . but I didn’t have any of my homemade marinara sauce, but I did have mozzarella cheese and pepperoni! The only thing I needed was a sauce. I checked my pantry for tomato sauce and I did have a jar so, I used it. Yes, “ready” sauce, remember I was really hungry. Besides, I was already using a pre-made dough. The garlic & herb dough was very lofty and airy when I took it out of the package and the garlic and herb aroma was nice and fragrant. I couldn’t find my pizza pan so I placed the dough on a stainless steel baking sheet that I lightly greased with olive oil and dusted with corn meal. I didn’t roll out the dough because it was going to take more time, so I stretched and pressed it on the baking sheet making sure that the dough was evenly distributed. The dough was very easy to work with and wasn’t too sticky. I usually like my crust thinner, but I was lazy and hungry so the crust was a bit thicker than I usually make it because I didn’t roll it out. I placed the traditional three ingredients, plus a few capers, on the green speckled pizza dough and baked it in a 475 degree oven for about 10 minutes. As the pizza was baking the garlic and herb aroma filled the kitchen and I could hardly wait for it to be done. After 10 minutes the dough had bubbled and blistered and it was done. I let it cool for about 2 minutes before I cut into it. I took a bite and was truly surprised how good it was! The dough baked up very soft, was elastic, tender and fragrant. It was also crispy and was well seasoned with just enough salt. Many pizza crusts lack flavor because there’s no enough salt in the dough. But this crust was very flavorful and complimented my simple toppings. Next time I will take the time to roll out the dough thinner like Neapolitan pizza’s. 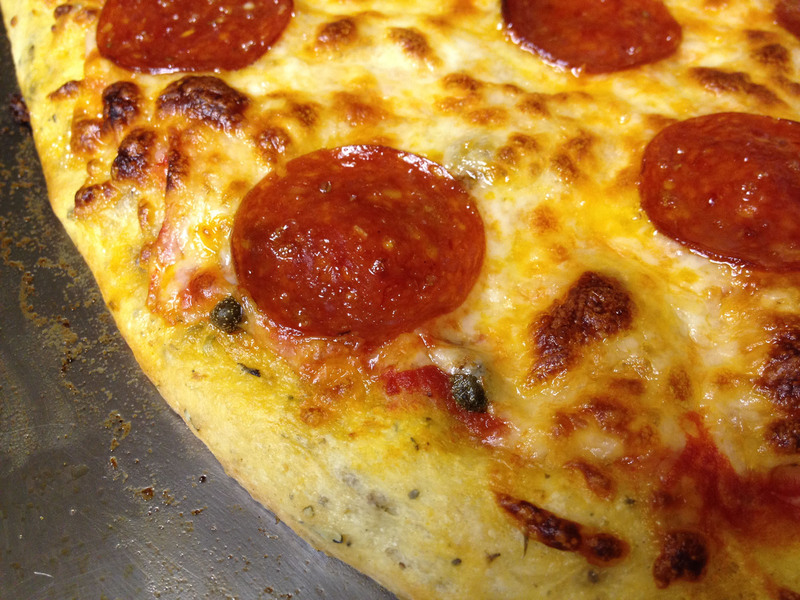 Trader Joe’s Garlic & Herb pizza dough made my “Trader’s” list when I’m craving a quick “homemade” pizza.